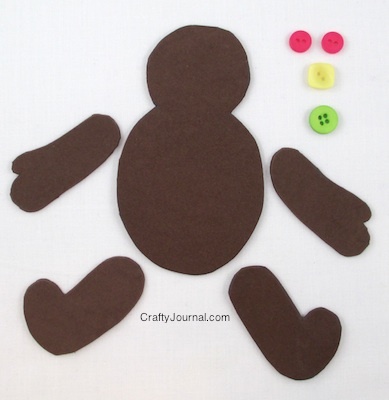 Create this delightful poseable gingerbread man to entertain little ones. It’s easy to make and fun to play with. It would be a perfect stocking stuffer or small gift at a party. Kids can even make them as a party activity. How to Make a Poseable Gingerbread Man. 1. Draw a gingerbread man on some scrap paper. Define his body shape, and the shapes of his arms and legs. 2. Make a pattern from this drawing. You only need one arm and one leg pattern. 3. Trace the body and 2 arms and 2 legs onto the brown craft foam. Turn the arm and leg over to make the second one of each. 4. Cut the shapes out. 5. Punch 4 holes on the body where the arms and legs will be joined. Punch a hole at the top of each arm and leg. 6. With a white pen, draw a zigzag on each arm and leg. 6. Using brads, attach each arm and leg to the body. Put the arms and legs on the back of the body. 7. Glue 2 buttons on the face for eyes. Glue a piece of string in the shape of a smile under the eyes. 8. Glue 2 buttons on the front of his tummy. Look what he can do. What can your kids make him do? And as always, be careful with small parts around very young children. It’s hard to find a white paint pen that works well, so a great alternative is to use decorative scissors to cut strips from white card stock, and glue them on the arms and legs. For the mouth, you can use red yarn or a small bit of red craft foam cut in a smile instead of string. Such a talented gingerbread man! 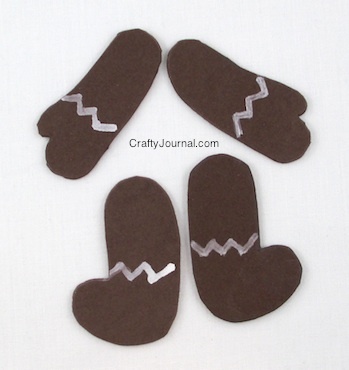 This is another great kids craft. Thanks for linking to the In and Out of the Kitchen Link Party. Hope to see you next week.